Mo Huballa and Jack Pisani came to the aide of Derek Blakelock after he collapsed while running near Chews Elementary School. 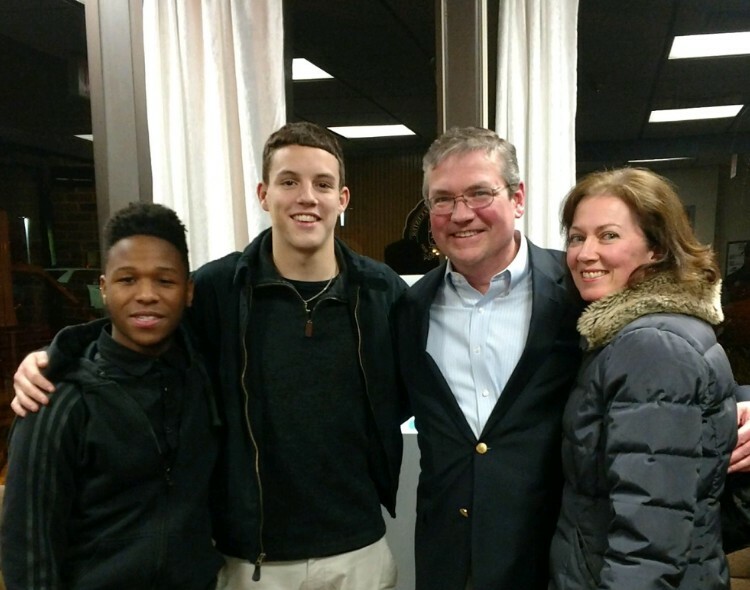 Highland Regional High School seniors Mo Huballa and Jack Pisani, were honored at Gloucester Township’s recent council meeting for coming to the aide of Gloucester Township resident, Derek Blakelock, who went into cardiac arrest while running. The young men found Blakelock lying on the ground as they drove past Chews Landing Elementary School. From left: Mo Huballa, Jack Pisani, Derek Blakelock and his wife, Megan Blakelock. It was Friday, Nov. 11, Veterans Day, and Highland Regional High School seniors Mo Huballa and Jack Pisani were driving to Pisani’s house after the girls soccer championship game. It was also Derek Blakelock’s birthday. The Gloucester Township resident took the day off from work and went for a run in the afternoon in his neighborhood around Chews Elementary School. It started out as a typical day for all three men, but the day took a drastic turn around 4:30 p.m.
On the drive to Pisani’s house, Huballa and Jack saw a body lying near the school’s property. They pulled over and heard the man gasping for air. It was Blakelock. They didn’t know who he was at the time, but called 911. Huballa recalled the first set of paramedics to arrive performed CPR on Blakelock right away. According to Blakelock’s wife, Megan, the paramedics told her Derek lost conscious when the paramedics arrived. He was transported to Our Lady of Lourdes Hospital in Camden where he was placed on life support. She said they were able to resuscitate his heart, but he was in a medical coma and didn’t wake up until Sunday evening. Blakelock ended up having a blocked artery that caused him to go into cardiac arrest. Doctors inserted a stent in his artery, and he’s been feeling back to normal ever since. “They had no idea how this happened, why it happened, and they were all completely surprised,” Megan said. “The EMT told me less than 10 percent of the people who go into cardiac arrest and don’t receive immediate health care don’t survive,” Derek said. Huballa and Pisani visited Blakelock a few times at the hospital and at his home to give their wishes and prayers. The Blakelocks are grateful for their actions and don’t think Derek would be alive if it weren’t for their quick thinking and the paramedics’ timely response. “You really appreciate the fact that two teenage boys who were just driving by, they can take the time to stop and see what’s around them,” she said. Huballa said timing was everything, and they were in the right place at the right time. The young men and EMTs were recognized by Gloucester Township Mayor Dave Mayer and council at the recent council meeting.